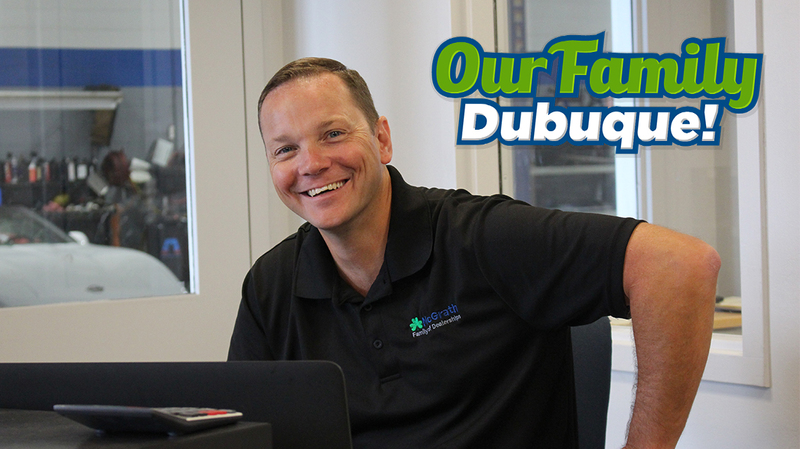 The spotlight is on Kevin Krogmann, our Service Manager at McGrath Chevrolet of Dubuque. There are two things very evident about Kevin, he is a dedicated hard worker and he a true family man. A Dubuque native, Kevin graduated from Western Dubuque High School in Epworth. The first car he ever had was a 1984 Buick Regal and he absolutely loved it. Kevin currently lives in Farley with his wife Kari of 15 years and their two boys, 14 year old Connor and 12 year old Collin. His family is his happiness. He has a strong admiration for his wife and all the hard work she puts in and his biggest achievement is definitely being a dad. Kevin has coached youth football the last seven years and currently coaches a 14u and 12u baseball team. He definitely has a passion for coaching. Better than yesterday, better tomorrow than today. The passion for coaching can be seen beyond youth sports and into his career. Kevin started out washing cars as his first job and continued to climb until he became Service Manager. He enjoys coaching his team in the service department, encouraging them to become better and achieve things they never thought possible. Kevin continuously strives to develop his management and leadership skills and hopes to have a long and successful career!